bar open daily at 4:00pm. We have 10 spaces available in the lot behind the restaurant marked for Pasture. Please get a pass from host to display in windshield. We recommend trying 4th, 5th and Grace st. for street parking and additionally there is a pay lot at 6th and Franklin for $6 all night parking after 6 p.m. 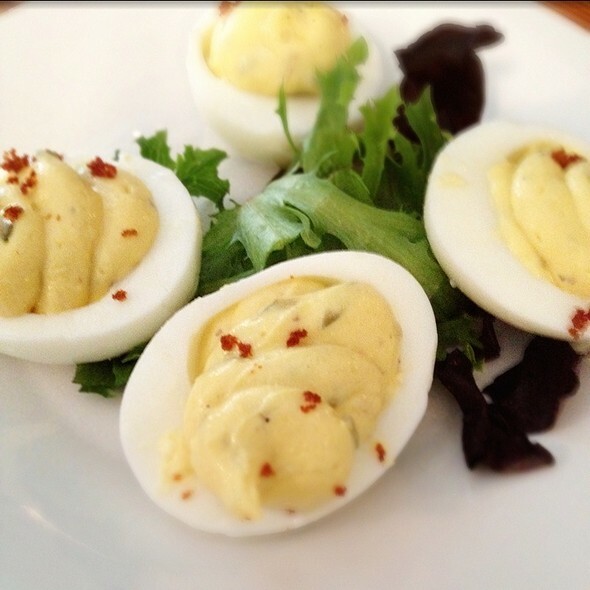 Please call the restaurant to inquire about private party or Happy Hour. We have many options available. Came with a large group for a nice night out. Did not disappoint. Food, drinks, service, all outstanding. Food was as excellent as the service was spotty. 30 minutes after sitting down, we'd seen our server once. We'd ordered drinks but still didn't have them and we had yet to order food. And the restaurant was, at best, half full. The manager stepped in when apparently he saw our drinks sitting on the bar and not getting delivered and he was apologetic and charming. And he threw in a round of meatballs to make nice. Our server never once apologized nor seemed to care, but we had a regular visit from the manager who made sure food and drinks were flowing. As for the food and drinks, excellent! Our table had split opinions on the fries but the rest of the food was universally agreed to be excellent. There wasn't anything I wouldn't order again! Craft cocktails and thoughtfully prepared dishes make Pasture a favorite dining destination. I’m not sure what’s going on with Pasture. I’ve been coming here for years and the food was just not good this time around and prices have gone sky high. A shake and bake pork chop with potatoes was $27 and thin strips of over cooked flounder was $24. Cornbread appetizer was so try and flavorless, it was sad. I’m going to be taking a break from Pasture for a while. I’m sure rent has gone up with explosion of restaurants around this area but the prices and food are totally off par and now better options all around. We had a great experience at Pasture. The menu was so interesting and the ambiance was just right. Not too crammed together but still cozy. Great venue; extensive menus served up promptly by engaging staff. Food quality very good and reasonably priced. We were seated right away and the waiter took my drink order. It did take a little longer than I thought it would to get my wine. We ordered the cornsticks with honey and butter. I was not impressed. They were extremely dry and had very little flavor. The honey drizzled on them didn't help much. The waiter then disappeared to god knows where and didn't come back for a while before taking our dinner order. I actually had to stop him to take our order. Keep in mind, the restaurant was not the least bit crowded and I believe he only had one other table that he was waiting. At this point I wasn't really looking forward to my main course but that all changed when it arrived. We both ordered the pan seared fish. It was outstanding. The fish was very crispy and flavorful and the potatoes and pearl onions were the perfect accompaniment. We did not order dessert as I had to get back on the road and didn't have time but I would like to try it next time. If the waiter hadn't kept disappearing in the back during out entire meal I probably would have given them another star. I would also skip the cornstick appetizer. I will try something else next time. The atmosphere, appetizers, and drinks were great! However, my friends fish looked like it had been over cooked on a campfire... two days ago. She did say everything else in the dish was great. I had the steak, again over cooked, but tasted great. Staff was accommodating when they found out and were great in general. I’d return again for apps and drinks, but might pass on dinner. We had the Rockfish - it was cooked to perfection! The service was outstanding. The special cocktails are not to be missed! Everything was absolutely wonderful! The timing of everything that was served was flawless. Loved our waitress!! Food is impeccable. It was my first visit and the food was exceptional! I will definitely be back again soon! Well, I had hoped that this would be a great experience but it wasn't . . . first, they couldn't find our reservation -- sometimes these things happens so we were ok with it and sat at the bar. One bartender was super personable and responsive, the other seemed annoyed that we were there. We started with the boudin balls -- unfortunately, they were mushy and cold in the middle with hardly any dipping sauce -- we asked to return them and order something else. The general manager, John, was awesome, apologized profusely and got us another app -- the steak tartare. Well, that was no terrific -- they put some peppers or something in the tartare -- please don't add anything to tartare -- needs to be super fresh, high-quality beef, super cold and nothing else. My husband got the quail special -- good flavor, overcooked, some burnt parts. I got the brussels sprouts and the mushroom leek bread pudding -- both of these were EXCELLENT! Again the wonderful general manager, John, checked in on us. Apologized again for the reservation issue and the cold boudin balls and offered us a FREE DESSERT -- which was a delicious cookies and cream concoction with a brownie hidden in the middle -- YUMMY! So, this was definitely a hit-or-miss experience for us -- John is a great manager but he shouldn't have to do all of this in the first place . . . none of these issues should be happening in a downtown Richmond restaurant, especially with all of the amazing restaurants all over town and reputation of Richmond being a "foodie" city. Unfortunately, not sure if we'll be going back. we arrived ontime for our reservation saturday nite 3/16/19; the place was 90 % empty. Soooooooo, we were taken to the very back next to a supporting post for the ceiling. after quite a while a waiter appeared. we ordered off their menu. several minutes go by ; the waiter reappears and says one of the items u ordered is only served @ lunch [ NOT stated on menu ] . everyone on staff seems to move very slowly. the inside is shabby-sheik i guess. there r too many really good restaurants in Richmond to go to so; we will not go back to this one. Low-key comfort food; friendly, informal, quirky but efficient service. Excellent place to try some new food. Ate here on a business trip and was surprised. The cocktails and food are great. One of the best meals I have had. Live in Boston and visited some very nice restaurants and the meal here was truly great. The rockfish was very tasty with a little kick but not too much. I also tried the smoked mushroom and leek bread pudding with was out of this world. To top it off, my waiter John presented me with a surprise dessert for my birthday which my daughter had called in. It was a simple glass with brownie on the bottom topped with vanilla custard and topped with crumbled cookies. This was of course topped with a candle for my birthday. Great way to celebrate my birthday, even if I had to do it alone. The general manager John stopped by to see how everything was and we chatted for a bit. A great experience. The smoked mushroom & leek bread pudding is amazing! I ordered 2 small plates; the salad and brussel sprouts. They were both delicious and a nice size for the price. I find the alcohol to be overpriced in most downtown restaurants but the selection at Pasture has depth with out offering too many things to choose from. Our server was a bit unorganized and not super helpful with the menu. 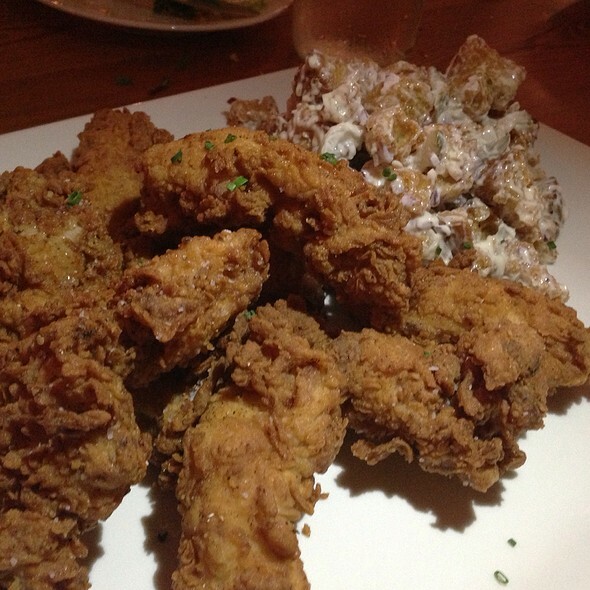 Great easygoing service and comfort food at its best. A little too bright in the evening. I am really sad to say, and shocked to say , it was not great. I have heard great things, but I am in no hurry to go back. The food, and service was ok . Not horrible, but not great. The pimento Cheese appetizer was excellent, burgers were suggested by the server, and they were ok. It took over an hour to get our entrees and they were not busy. The bar was empty and there were just a few other people there. The staff was attentive and fun. Food was delicious and craft cocktails amazing. Thanks for a great bday dinner. The food was decent, love the location, and they made it right on the drink (comped it) and gave me free bday dessert (carrot cake was divine). Service was excellent without being overbearing. Soup du jour had perfect spice and texture. Apps came out immediately. Entrees were reasonably priced. The space is charming but a touch too live, so noise level from tables near us could get loud, even with normal speaking voices. But overall, very pleasant experience and I will definitely come back. 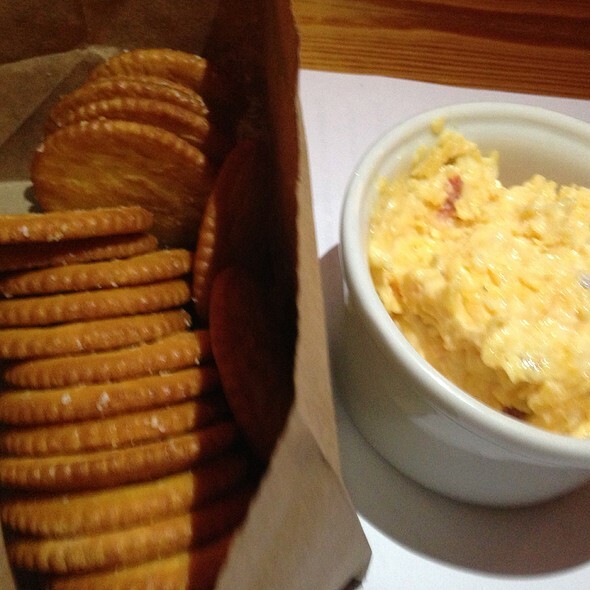 We LOVED the scrumptious pimento cheese and Ritz crackers! Our entrees were superb: I had the bistro steak and the potato/butternut squash gratin mornay; my husband had the fish of the day with the cornmeal dumplings (sort of a cross between gnocchi and hushpuppies) with the vegetables in a bowl. He had a local beer; I had a glass of Malbec. We had no room for dessert, but we managed to extend our Pasture experience by one more day because we took home a pint of pimento cheese, to which the fine folk at Pasture added a sleeve of Ritz crackers! Our server, John, was friendly and helpful. We will be back! Our dining experience was well-worth the 2.5 hour drive! Had a lovely dinner consisting of soup, sliders, entrees, dessert - with enough leftovers for another meal! Great service. I've been to Pasture many times...it always ranks 5 stars for food, service, atmosphere. Great place. Absolutely awesome staffs. We are return customers and really enjoy the setting. We had a wonderful experience starting with the reservation. We were warmly greeted by the hostess and seated right away, even though we were 15 minutes early. Our waitress was pleasant, friendly and attentive. Food was superb and the right portion size. The sautéed broccoli was especially delicious. Have always enjoyed the casual comfort and enjoyable vibe of the Pasture especially before going to the theater. First off, if you can get Laney as your server, you will be happy. Very friendly, knowledgeable and professional. On to dinner...2 folks had the rockfish, which they loved, 1 had the small plate ribs with a grit cake and I had the Bistro Steak. As I said, all were happy with their meal and I will add that I requested that my Bistro Steak be medium rare and they NAILED it! Perfect. Enjoyed our meal there. Suggestion: make a reservation...it gets active QUICKLY! Thanks great service and food! The service is excellent but the menu for lunch is very limited and not very exciting. They ran out of food fast. They really need a new menu for what limited items they offer but they were well-prepare. So it is not the chef's problem but menu planning. Great meal, interesting menu. Service top notch. Cool industrial vibe.